This information applies to pages in the CSUN template system.Windows-press ALT + an access key. Macintosh-press CTRL + an access key. What Will CSUN Read in 2008-2009? Nickel and Dimed by Barbara Ehrenreich is the winner! 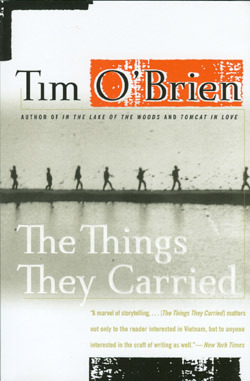 CSUN's 2007-2008 Freshman Common Reading is The Things They Carried by Tim O'Brien, a wonderful collection of twenty-two closely related stories that chronicle the narrator's experience before, during, and long after his time as a youthful American soldier in Vietnam. As a new freshman, you are invited to read the book (and you may find it assigned in one or more of your classes this fall) and to talk about it as part of a campus-wide intellectual community of readers. The book offers an important academic complement to the social events that are part of CSUN’s summertime New Student Orientation. It places academic engagement—teaching and learning—at the very center of the community we are asking you to join. And it allows us to think, talk, and learn together across and beyond the boundaries of any single classroom. Join the academic community: read this book, talk about it with other students, with faculty, with staff, administrators, and even (who knows?) with your family. Friday, February 29, 2008, at 8:00 p.m. Opening night for Even Steven Goes to War, a Theatre for Young Audiences play by Allison Gregory. At CSUN's Little Theatre. Runs through Sunday, March 9.